The local tire big-box store had a special recently. If you went in for routine service on your vehicle, they would give you a selections of portable compressors free of charge! I took advantage of that offer as I do most times when something is free or is an incentive to purchase something I already plan on buying. The free air compressor I selected plugs into my vehicles 12 volt power outlet. When switched on, it will discharge compressed air at up to 125 PSI. Wow! 125 PSI from this dinky little compressor. The flow rate of compressed air from this little air compressor is very low. So low that it might take what seems like forever to fill up a tire or air mattress. But…it is a portable air compressor, for sure! And after all, it was free! When looking for portable compressors, unless they are free and you just want one to have, decide first what do you need compressed air for if you want to make sure you get one that will have enough air supply at the right pressure for you. What you need air for will tell you the air-producing capacity of the portable compressor that you will need. An air driven jack-hammer will require the output from a towed 175 CFM portable compressor. A small blow off gun will only need a very small air compressor. How do you choose? If you are not sure about your air tool consumption here is a guide to air tool compressed air demand. The little compressor shown below is just that, a little air compressor. Yet, if we had a low tire and were stuck somewhere in the wilderness, and we could plug this air compressor into the vehicle power supply, we could sit in the relative comfort of the vehicle while it slowly…oh yes, oh so slowly, brought the tire up to pressure. That is, assuming it works when you need it! I tried to use one similar to this the other day, and the darn thing would not cycle, and burnt the fuse. A good lesson. You sure want to test your air compressor periodically. Do not assume that just because you have it with you for years in the trunk of the car, that it will work when you need it. You do need to be a bit careful when using these little air compressors, too. Some of these low flow, compact air compressors can put out 250 PSI, and with enough time might blow the tire, or an air mattress or a beach ball to smithereens! Once you have figured out the capacity you will need (another way of saying capacity is…how many CFM of air at what pressure will you need? ) for your air tools, you will have to decide on the type of power supply for the portable air compressor that delivers the air you need. While the air compressor shown in the first photo will need a special power receptacle to plug it into the car, the next one is a portable air compressor that can be carried from place to place on the job site, and plugged into a standard 120 volt outlet wherever compressed air is needed. What portable compressor will you choose if you are working on a job site nowhere near electrical power? Gas powered? Diesel powered? Before selecting a portable compressor, give some thought to how you will get power to run it. Regardless of what portable compressor you choose, you will face all the same issues relating to compressed air as if your compressor were a 100 HP unit supplying the air to a commercial establishment. Watch out for compressed air created water problems. If the portable air compressor you choose does not come equipped with an in-line compressed air filter you will want to add one if your air use is fairly constant. You can see the page on filters linked from the Sitemap page if you want more info on them. 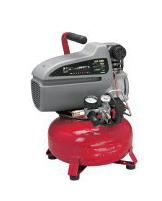 The majority of portable air compressors are factory equipped with a compressed air regulator. Air regulators offer benefits such as reduced air/energy use and reduced air equipment wear. You do not drive your car with the foot to the floor on the gas pedal all the time, why operate your air tools with the air pressure equivalent? Run your tools at the lowest working air pressure for longer tool life. There’s a page on regulators on this site offering full information about them if you wish to check it out. You want to know that an air regulator, set 10-15 PSI below the compressors low pressure set point (also known as cut in pressure point) will help ensure that your air-using application will see a steady stream of compressed air at a non-varying pressure. As the pressure in the compressor tank peaks and wanes due to compressed air use, with the regulator set below the compressors lowest pressure setting your air tool should never experience a change in that constant, lower pressure flow unless the air demand of that air tool exceeds the capacity of the compressor to deliver that volume and pressure of air. In this case, the pressure coming from the receiver will continue to decay down past the regulator setting, and it will keep dropping as long as more compressed air is being used by your air tool than your compressor can generate. 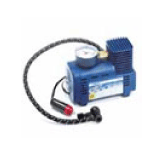 If you are running an air tool with your portable compressor, it may need a lubricator after the filter and regulator. The lubricator will deliver measured amounts of air tool lubrication oil to the air tool as you use it. Some air tool oilers are installed in the air line just before the air tool. A high-use, high-air-demand air tool may benefit from one. On the other hand, if your application is, for example, air brushing, then you do not want oil spraying out with the paint, and no lubricator would be installed in an air line to a paint spray gun. Oil carryover in the compressed air line is an issue for some portable compressors particularly if the compressor is oil lubed, and very much particularly if the compressor is older, as the cylinder seals tend to leak more in older compressors. Almost all oil-lubricated air compressors will have some oil carryover. If this is critical problem for what you are doing with compressed air, then you will want to add a coalescing filter downstream of your compressor, and as close to the point of use as possible, to remove oil from the air stream. See the page on coalescent filters on this site for more info about them, if you wish. To increase the life of the coalescent element in the oil-removing filter, install a 5 Micron general purpose compressed air filter upstream from the coalescent filter. This general purpose filter will remove free water and larger (relatively speaking) particulates from the air stream, freeing the coalescent element to work on oil removal and helping this more expensive filter element to last longer between changes. If your compressor duty cycle is high – as in you are using the compressor all day – you might also add a 40 Micron general purpose filter upstream from the 5 Micron unit. This will extend the life of both the 5 micron and coalescent filter elements. Preparing compressed air for use in any application is a continuum. You keep adding equipment to the compressed air stream to condition the compressed air to the level the equipment needs. That may mean that you have to throw quite a bit of money at it, others can get by with just a general purpose 40 micron filter. The application for compressed air dictates the level of treatment. Sometimes the air-using equipment demands a larger compressor, and there are a variety that are still portable compressors, but not carry. These portable air compressors are on wheels. Small portable compressors are typically configured with an electrical cord and plug to connect the unit to a 120 VAC outlet. Some compressors are dual voltage, and can be wired to run on a 220 Volt circuit and a 120 volt circuit. Make sure you are comfortable with rewiring the compressor motor to change voltage should it be necessary. Not sure? Be safe! Leave electrical work to persons that are qualified! When powered by 220 volts, compressors are more efficient and have greater capacity than when supplied by 120 VAC. The air compressor is a converter, turning electrical power into stored compressed air energy. A 120 volt circuit has less energy available for conversion to compressed air energy than does the 220 volt circuit. The 220 can generate higher flows of compressed air from the appropriately sized compressor. Portability of compressors knows no bounds! Compressors are routinely flown into to remote sites all over the world. How often do you drive down a highway and see a work crew using a portable compressor on road construction? Since construction usually slows traffic (almost always when you are in a hurry and trying to get somewhere quickly it seems) you will have the opportunity to check out the portable compressor as you drive by. The compressor in the latest photo is a rotary screw, continuous run, with a 100% duty cycle, and is powered by diesel fuel. When it comes to portable compressors, the same rules for selection apply as they do to in-plant compressors. If so, do add it here, and please upload some photos focusing on the problem area?